[334 Pages Report] The global life science Instrumentation market is projected to reach to reach USD 75.24 Billion by 2022 from USD 51.18 Billion in 2016, growing at a CAGR of 6.7% from 2017 to 2022. Base year considered for the report is 2016. This research study involved the extensive use of secondary sources, directories, and databases (such as Hoovers, Bloomberg Business, Factiva, and Avention) to identify and collect information useful for this technology-based, market-oriented, and commercial study of the global life science instrumentation market. 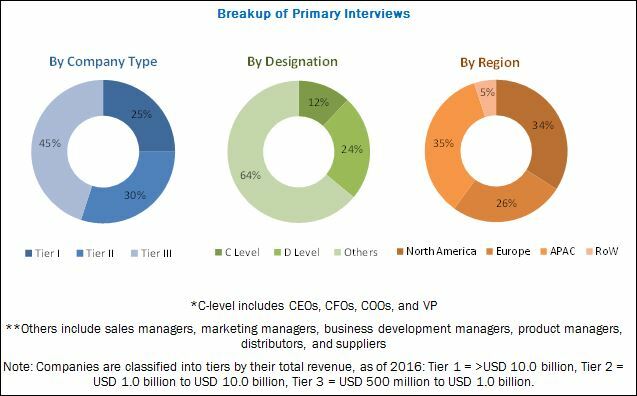 In-depth interviews were conducted with various primary respondents that mainly included key industry participants, subject-matter experts (SMEs), C & D level executives of key market players, and independent industry consultants, among others; to obtain and verify critical qualitative and quantitative information as well as to assess future market prospects of the global life science instrumentation industry. Thermo Fisher Scientific, Inc. (US), Danaher Corporation (US), Agilent Technologies, Inc. (US), F. Hoffmann-La Roche Ltd. (Switzerland), Bruker Corporation (US), PerkinElmer, Inc. (US), and Waters Corporation (US) are some of the key players in the global life science Instrumentation market. These players are striving to expand their presence in the emerging countries of APAC and the Middle East & North Africa (MENA) regions through product launches, partnerships, agreements, and collaborations. The global life science instrumentation market is expected to reach USD 75.24 Billion by 2022 from USD 54.49 Billion in 2017, at a CAGR of 6.7%. The growth of this market is majorly driven by increasing spending on pharmaceutical R&D, rising food safety concerns, technological advancements in analytical instruments, and the availability of funding for life science research. The growing proteomics market, rising environmental safety concerns, increasing demand for analytical instruments from various industries, and huge demand in emerging nations for life science instruments offer high growth opportunities for market players. The report analyzes the global life science instrumentation market by technology, application, end user, and region. Based on technology, the spectroscopy segment is estimated to command the largest share of the global market in 2017. This can be attributed to the widespread application of spectroscopy systems across several industries, including pharmaceutical, biopharmaceutical, food and agriculture, environmental testing, and industrial chemistry. Each analytical technology is further segmented by its end users. The major end users of this market include pharmaceutical, biopharmaceutical, and biotechnology companies; CROs; research institutions; hospitals, clinics, and diagnostic laboratories; academic institutions; forensic science laboratories; food and agriculture industry; and environmental testing industry. Pharmaceutical, biopharmaceutical, and biotechnology companies are estimated to account for the largest share of the life science instrumentation market. Rising food and environmental safety concerns, availability of research funding for academic institutions, increasing number of criminal cases, growing number of drug discovery and development related research studies, and rising prevalence of target diseases and testing procedures related to them are pushing the demand for these analytical instruments among end users. 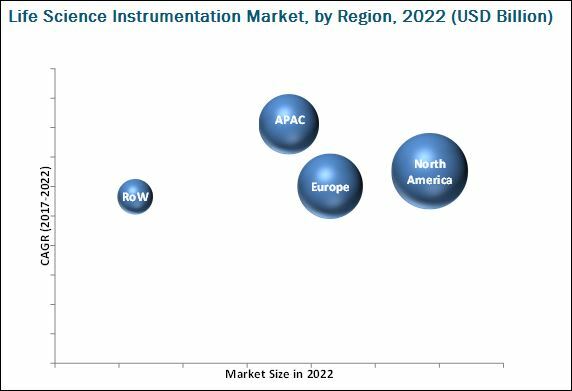 This report covers the life science instrumentation market across four major geographies, namely, North America, Europe, Asia Pacific (APAC), and the Rest of the World (RoW). North America is expected to account for the largest share of the global market in 2017, followed by Europe. The large share in the North American region is mainly attributed to the large number of ongoing research activities, the presence of a large customer base, and availability of funds for drug discovery processes and life science research studies in the region. Europe is estimated to command the second-largest share of the global market. The presence of a large number of API manufacturing facilitates, growing research on biosimilars, public-private financial investments for the development of analytical instruments, and the developing pharmaceutical sector in Russia are some of the key factors driving the growth of the life science instrumentation market in Europe. The dearth of skilled professionals and the high cost of technologically advanced analytical instruments are the key factors expected to restrain the growth of this market. Thermo Fisher Scientific, Inc. (US) dominates the market through its wide range of technologically advanced and innovative life science instrumentation products. The company adopts the strategy of product launches, agreements, and partnerships to maintain its leading position in the market. Other prominent players in the market are Danaher Corporation (US), Agilent Technologies, Inc. (US), F. Hoffmann-La Roche Ltd. (Switzerland), Bruker Corporation (US), PerkinElmer, Inc. (US), and Waters Corporation (US), among others.